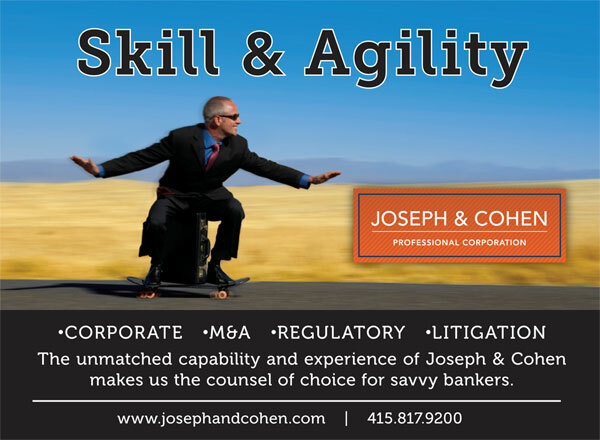 For this year’s marketing sponsorship, Joseph & Cohen, which specializes in representing independent and regional banks, chose the image below of a well-dressed attorney riding a skateboard. The concept emphasizes the firm’s ability to solve complex legal matters with skill and agility in a laid-back but professional and cutting edge manner. Joseph & Cohen believes its fresh vision provides a competitive edge in connecting with the next generation of banking leaders. To learn more, call 415.817.9200 to speak to either of the firm’s name partners: Jonathan Joseph or Jon Cohen.